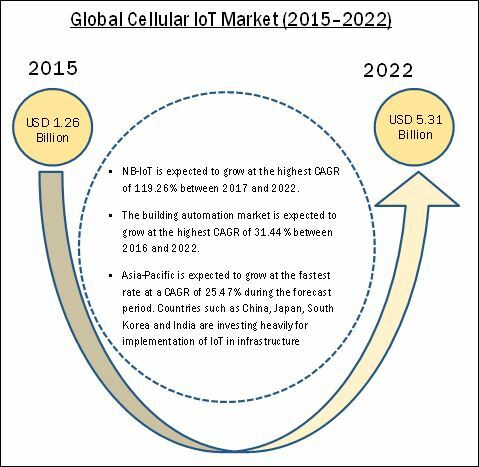 [161 Pages Report] The cellular IoT market is expected to grow from USD 1.26 billion in 2015 to USD 5.31 billion by 2022, growing at a CAGR of 23.34% during the forecast period. The base year considered for the study is 2015, and the market size forecast is given for the period between 2016 and 2022. This report provides valuable insights into ecosystem of this market including chipset manufacturer, and device manufacturer companies. The major players in the cellular-IoT market are Qualcomm Inc. (U.S.), Gemalto N.V. (Netherlands), Sierra Wireless (Canada), U-Blox Holding AG (Switzerland), MediaTek Inc. (Taiwan), Telit Communications PLC (U.K.), ZTE Corporation (China), Mistbase (Sweden), Sequans Communications (France) and CommSolid GmbH (Germany). Currently, connected devices are running on the same networks and protocols that support the Internet and mobile communications—cellular, Wi-Fi, Bluetooth, and so on. However, embedded sensors and other distributed devices enabled with Internet of Things have different network requirements than those of computers, phones, and/or tablets. While using the Internet, generally the data is accessed irregularly and in large chunks such as websites or streaming videos. Remote sensors and smart machines, on the other hand, often only need to send small packets of data at regular intervals, and need to connect in areas away from the traditional infrastructure and a convenient power supply. Most of these devices are spread out in such a wide area, and devices can be situated in hard to reach places, such as basements or inside elevators, where enhanced coverage is necessary. Many of the deployed objects may also be moving; therefore, the broad coverage is required to ensure uninterrupted coverage. With the increasing demand from customers to integrate smartphone functionalities into vehicles for a better driving experience, automotive OEMs are strongly focusing on providing seamless in-car mobile connectivity solutions. Automobile manufacturers are integrating wireless communication into both luxury and economy vehicles. With the advent in communication technology that enables vehicular communication much easily and effectively, the drivers are now capable of getting emergency alerts before they can reach the actual destination. There are various types of communication prompted by IoT devices such as in-vehicle communication, vehicle-to-vehicle communication, and vehicle-to-infrastructure communication. Where is all the development taking place in cellular IoT market? What are new application areas which the vendors are exploring? Who are the emerging companies in cellular IoT market? 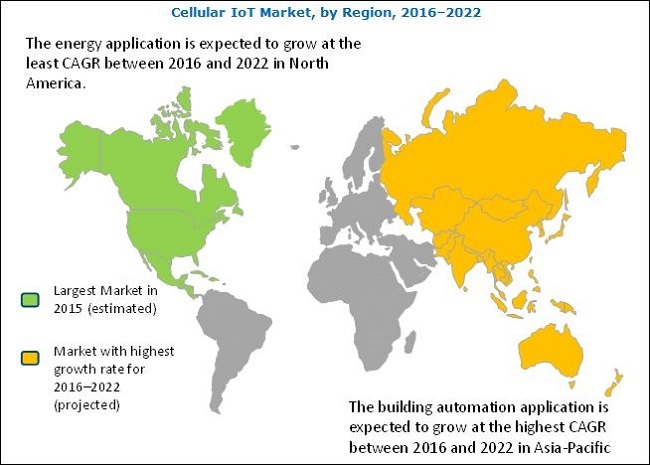 According to the Markets and Markets forecast, the cellular IoT market is expected to grow from USD 1.26 billion in 2015 to USD 5.31 billion by 2022, at a CAGR of 23.34% between 2016 and 2022. The growing demand for low power consuming devices and rising demand for extended network coverage area drives the demand for cellular IoT technology. Moreover, growing demand for end–to–security also contribute to the growth of the market. This report segments the cellular IoT market based on offering, type, end-use application, and geography. On the basis of offering, the market has been divided into hardware and software. The hardware segment held the largest market in 2015. The advanced chipsets for cellular IoT consume less power and provide reliable and secure connection for various IoT applications. The advantages of these modules in comparison to other technologies such as LoRA, SigFox, and so on drive the demand for cellular connectivity in IoT applications. The cellular IoT market for software is expected to grow at the highest rate between 2016 and 2022. Network enhancement is one of the major factors driving the growth of software in market. In terms of type, the 2G market held the largest market share in 2015. 2G is widely adopted for IoT applications because of low cost of chipset, and majority of connected devices in massive IoT require low data transfer rate which makes 2G an ideal connectivity technology in comparison to 3G, 4G, and others. However, NB-IoT is expected to grow at the highest rate between 2017 and 2022. The demand for longer-range communications due to the increase in the demand for connectivity between mobile objects or objects spread out across a wide area drives the growth of NB-IoT market. On the basis of industry, energy held the largest market share in 2015. The increasing adoption of smart meters and smart grids drives the growth of cellular IoT modules in energy industry. However, building automation is expected to grow at the highest rate between 2016 and 2022. The demand for energy management, along with the increasing demand for green homes, drives the growth of building automation market. North America accounted for the largest share of the cellular IoT market. The U.S. is major contributor to the growth of market in North America. Investment from U.S. government towards implementation of IoT across various sectors such as building automation and utilities under programs such as “Smart America” is driving the North America market for cellular IoT. Deployment of smart city and smart infrastructure in countries such as China, Japan, and India contributes to the highest growth of Asia-Pacific region during the forecast period. The major players in the cellular-IoT market are Qualcomm Inc. (U.S.), Gemalto N.V. (Netherlands), Sierra Wireless (Canada), U-Blox Holding AG (Switzerland), MediaTek Inc. (Taiwan), Telit Communications PLC (U.K.), ZTE Corporation (China), Mistbase (Sweden), Sequans Communications (France) and CommSolid GmbH (Germany). Over the years, applications and industries require high-speed communication standards to provide the reliable connectivity platform. The cellular industry has evolved to meet the changing needs of the M2M market starting from GSM, GPRS 2G standards to HSPA-3G standards, and now LTE. Long-term evolution (LTE) is said to be spectrally different and more efficient than previous cellular standards such as 2G, 3G, HSPA, and so on. Long-term evolution (LTE) is said to be spectrally different and more efficient than previous cellular standards such as 2G, 3G, HSPA, and so on. The 4G LTE technology is growing and numerous devices are already LTE-enabled. Many automobile companies are launching new cars with 4G/LTE mobile Internet connection as a standard. Many countries such as the U.S. and Japan are already trying to achieve 100% LTE coverage. The LTE trend is thus bringing about a mobile wireless broadband revolution. 5G is expected to rollout in 2020 and is expected to handle about 1,000 times more data than today’s cellular systems. 5G would have a more flexible architecture, which could be closely aligned with the evolving needs of customers. 5G in IoT is expected to increase the data rate, reduce the end-to-end latency, and improve coverage. 5G technology is more than just an evolution of mobile broadband networks. It is expected to bring new unique network and service capabilities and operate in a wide range of frequency bands. The 5G technology would ensure user experience continuity in challenging situations such as high mobility and highly dense and thinly populated areas. 5G is likely to be a key enabler for the Internet of Things, which would provide a platform to connect a massive number of sensors, devices, and actuators with strict energy and transmission constraints for the connected devices. Commercialization of cellular IoT technologies such as NB-IoT and LTE-M is expected to replace 2G since these technologies provide support to more number of connections, larger coverage, area and lower power consumption. These new standards allow the devices which operate on cellular network to be less expensive and more power efficient. LTE-M has little higher data rate compared to NB-LTE-M and NB-IoT and can transmit a large amount of data. LTE-M, Narrowband LTE-M, and Narrowband (NB) IoT offer better security, lower interference as it uses a licensed spectrum-based network in comparison with the unlicensed spectrum low power wide area (LPWA) solutions such as SigFox and LoRa. NB-IoT helps in reducing power consumption, which can, therefore, be used for connecting devices that require a long battery life. NB-IoT is using the LPWA technology in a licensed spectrum, enabling deployment over existing mobile networks. How cellular technologies are addressing the fast-expanding market for low power wide area connectivity? Is 5G the answer to growing demand for high-speed internet and broad network coverage? How industry players are choosing cellular networks based on their applications?